We offer a variety of unique handmade Americana Quilts, which are each individually designed and made from a combination of vintage fabrics, homespuns, 100 % cotton, and soft flannels. We feel these are the best fabrics to use in creating a beautiful and soft quilt. Our quilts are not mass produced, but are handmade, hand produced creations made one at a time. 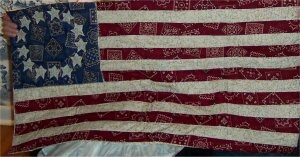 This beautiful handmade colonial flag is made from country primitive 100% cotton fabrics. It is a replica of our country’s first flag. It has the 13 stars and 13 stripes. The stars are appliquéd on. It measures approximately 36″X 28″. The back fabric is a small cream print. “God Bless America” let your colors show with our handmade raggedy flag quilt. It’s large enough to display as a wall hanging or on the back of a sofa. It can also be used as a throw or to snuggle up with. 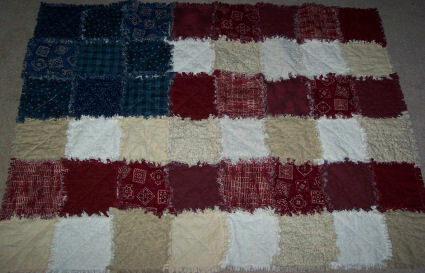 Our raggedy flag quilt is 47″ x 53″ and is made from 100% cotton fabric of assorted creams, navy blues, and cranberry. Our American Country sign is made from old barn wood that was taken from a very old beach “cottage” in Virginia. It is hand painted and has red/cream/blue scraps of fabric, buttons, and raffia.